Make no mistake - trees are BIG. 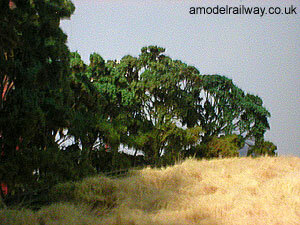 Fully grown real trees are much bigger than the model representations sold by model shops. See the guide at the base of this page. The building block of our tree is the wild herb Yarrow (Achillea Millefolium ). This is found along road side verges of the British countryside, where the underlying ground is chalk. It is ideal for our tree because of its compact flower head and rigid stem. 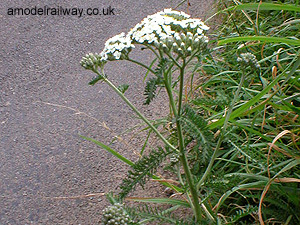 To identify the Yarrow look for its feathery leaves. 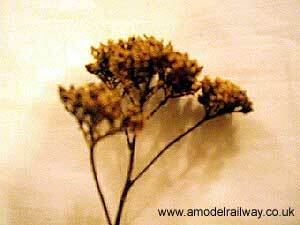 Harvest the Yarrow in late Autumn/Winter when the white flower heads and leaves have died to brown. 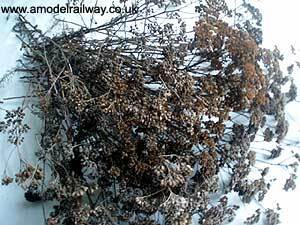 Once harvested the plants can be stored in a dry place for use throughout the year. There are about sixty stems in the photo, sufficient for 2-3 medium sized trees. Run your fingers along the stem to strip any remaining leaves. 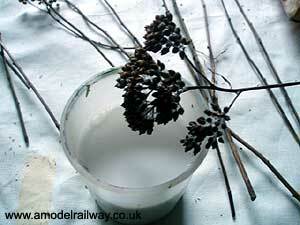 Water down the PVA glue to a consistency that leaves a white film when run off a spoon. Add a few drops of washing liquid. Dunk a flower head and shake off excess liquid. 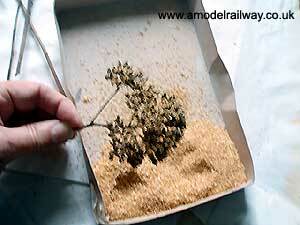 Sprinkle sawdust over the flower heads, top and bottom to give the appearance of leaves. You can use shop bought green scatter material instead of sawdust. Set aside to thoroughly dry. 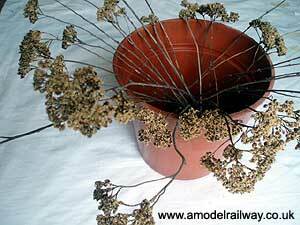 Here a flower pot is used to separate the stems and hold them upgright. 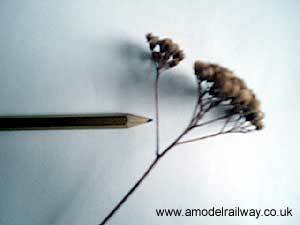 Select a straight stem with a domed flower head. This will be the "heartwood" and the top most leaf canopy. Do not cut the stem. This will be the tree fixing post through a hole in the scenery. Now work gets tedious. Have patience. Decide on the height of tree and select another stem that fits snugly to bulk out the dome. Cut the stem of this to your tree height. Glue to the first stem and clamp in place with pegs. Leave to dry. Repeat for 1 or 2 more stems. 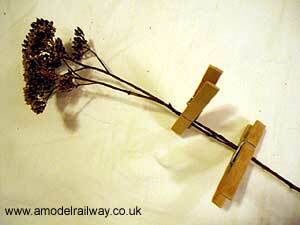 To create the side branches you will need to select a flower head that has side shoots. Glue the side shoot to a stem or another side shoot within the tree. Be aware of the shape you are creating by referring to real tree pictures. View the tree from all sides to decide where to place the next stem. Also mount stems at about right angles to the trunk locate and glue in the joint between other branches. It is preferred that the stem is not cut until the glue has set. You will need to set aside to dry after adding one or two stems. The trunk may need to be bulked out by glueing cut stems without flower heads to it. You thought that was tedious. Now you have a very delicate model on your hands, but the end result is well worth it. Spray paint the leaves and place in situ. This tree is 200mm tall, which is probably the maximum you should aim for and is passable as a small oak, sycamore or ash. Before you know it you will have grown an entire wood! Yarrow. Harvest in late Autumn/Winter. See slide 1 and 2. PVA Glue. Fast setting type preferred. Sawdust. Sieved to about 1mm pieces. 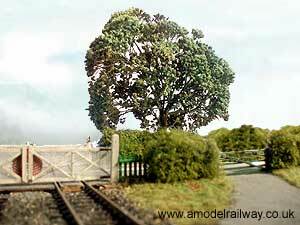 Alternatively, use green scatter material bought from model shop. Leaf green matt paint. Not needed if using shop bought green scatter material. Small electrical wire cutters. to cut stems. 10" Flower Pot to hold drying stems. 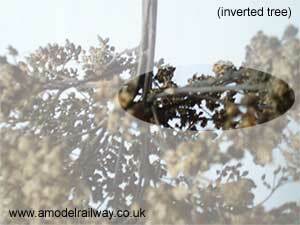 Narrow Vase to hold tree during drying periods. Modelling Air Spray Gun and Propellant. Not needed if using shop bought green scatter material.